The following information and formulas will help in constructing chords. We need to understand some information about tones and semi tones before we can go any further. On a guitar, a semi-tone is considered a half-step and is from one fret to the next. A tone is two frets apart and is considered a whole step. [Sometimes, people will say: "a whole step up" which means they are a tone higher.] With two exceptions, notes are a tone apart. The exceptions are when we move from B to C, or from E to F, where these notes are a semi tone apart. If we played each note in order, we would be playing what is called a chromatic scale. We can make use of a chromatic scale to illustrate this. Using the above chromatic scale above as a visual reference, it is easy to see that B and C as well as E and F are a semi tone apart. If, however, we were descending, A# would be B♭ and so on. The term for these interchangeable notes is: enharmonic equivalents. We can begin this cycle on any note and resolve back to that note. This note is called the root note or tonic. We have 12 tones that are half step apart. Now that we know about tones and semi-tones (or, alternatively, whole steps and half steps), we can understand the principle of the major-scale formula: Tone Tone Semi-Tone Tone Tone Tone Semi-Tone. We can use T's and S's or W's and H's to outline the major-scale formula and you will find both being used. Just to add to this a bit, you could also use numbers to represent the major-scale pattern and memorize it like a phone number: 221-2221 The 2's represent a whole step; the 1's, a half step. Root Note: This is the foundation for the entire chord and it provides the name of the chord with a letter. Third: This is either a major (3) or minor (b3) interval above the root. Fifth: This can be a "perfect" (5), diminished (b5), or augmented (#5). There are seven tones in a major scale; therefore, there are seven triads. Each note in the scale becomes a root. So lets look at the a few scales, starting with a "C" major scale. This scale is a natural scale with no sharps or flats in it. Additionally, we will number each note in order. A major chord is built using the one, the three, and the five. So, for the C Major Scale, this would use the following notes: C, E, and G.
And when you look at the C chord you play on your guitar (in first position), you will note that you are fretting the third fret on the fifth string, which is a "C" note; and you are fretting the second fret on the fourth string, which is an "E" note. And, you are playing the open third string, giving you your "G" note. 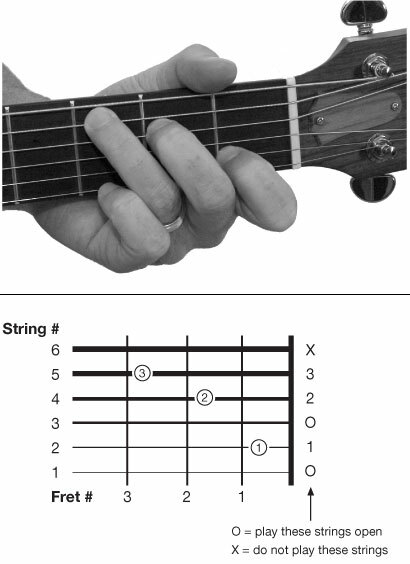 This is the basic construction of the chord, but most people will also play one or two more stings including fretting the first fret on the second string, giving you another "C" note; and finally, playing the open first string, giving you another "E" note. It is just too awkward in most cases to simply play the triad. Thus, in adding another 1st and 3rd degree (one octave higher), we can now strum strings five thru one a lot easier. Breaking down the G chord on the guitar, we typically play it by fretting the third fret on the sixth string, which is a "G" note; and fretting the second fret on the fifth string, a "B" note; the fourth string is open, a "D" note; the third string is open, another "G" note; the second string is either open, giving us another "B" note, or it is fretted on the third fret, giving us another "D" note; and finally, the first string is fretted on the third fret, giving us another "G" note. Here is one more scale and chord construction walk-through, but this theory can be applied to any major scale to build major chords. On the guitar, we play (again in first position) the third fret on the fifth string, giving us a "C" note; third fret on the fourth string, giving us an "F" note; third string, second fret, giving us an "A" note; first fret, second string, giving us a "C" note; and finally, the first fret on the first string, giving us an "F" note. Now that we know how a major chord is built, we can look at other formulas for chords and see how they are constructed. Triads rely on both it's third and fifth notes; or more specifically, the distance between the notes and the root note. We'll take the C major scale and work through how the other triads are derived from it. We'll go back to the C scale and look how the chords in the "Key of C" are derived. The table below shows all of the diatonic chords in the key of C. Diatonic means 'within the key' or 'across the tones of a key center'. A chord not in a key that is not in a particular family (key) of chords is considered nondiatonic. The above table can also be used as a Key Transposition Table as employed with the Nashville Number System. If you are interested in more information on the Nashville Number System, there are many resources available online. One that is particularly good is Jamplay. Typically, we add another root note to a triad to make it a 4-note chord (i.e., C-E-G-C). We can also add an interval to change the chord type.